Our local grocery store gives away a free magazine called Real Food. We picked it up a couple weeks ago & were surprised at how much we wanted to make from it, especially some unusual grilling recipes. This week we tried the Ground Turkey Yakitori. The recipe had versions for serving this over rice or as a burger. We did the burger version. This was an incredibly tasty burger. There is plenty of binder to hold the turkey together (often an issue with turkey burgers). 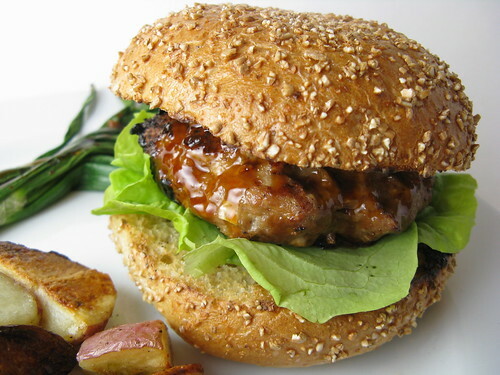 The Sweet Soy Glaze has a wonderful sweet/salty flavor, it was good on the burgers, onions & mixed into mayonnaise. Matt liked the mayo version as a dip for his roasted potatoes. This is not a flavor combination you'd usually expect for a grilled burger but it really works. In a small saucepan bring the Mirin, soy sauce, maple syrup, brown sugar, ginger & lemon juice to a boil. Mix the cornstarch & water together to dissolve the cornstarch. Stir into the boiling mixture. Let boil for about 15 minutes until thickened. Set aside to cool. Once cooled mix 1 T of the glaze into the mayonnaise & set aside to top the burgers. Mix all the burger ingredients together with your hands & form into two patties. Grill over medium-high heat for 3 minutes per side. Brush with glaze & flip. Grill 2 more minutes. Brush with glaze & flip again cooking 2 more minutes. When the burgers have about 5 minutes left put the onions on the grill & brush them with the glaze. Grill until they are soft. Brush both the burgers & onions with glaze once more before serving. Serve the burgers on rolls (sesame would be good) topped with the mayonnaise & lettuce. The onions can be eaten on the side or on the burgers. Ha ha i just posted a yakitori recipe in my place too :-)This burger looks so yummy, that i want to grab one from the screen. These burgers looks really tasty, the glaze sounds really good too. Love this idea for a turkey burger. I try to make turkey over beef but always add a lot of herbs or other type of flavoring. This sounds like it worked real well. Now this is a fab way to shake-up the summer BBQ...yummy! I'm loving this! What a great combo of flavors - sweet and salty. I'm hungry for a burger now! I don't know why I don't make more turkey. This sounds delicious, I'll have to try soon! I loved the Real Food magazine I got in December... I'll have to get Zach's mom to send us the current edition. 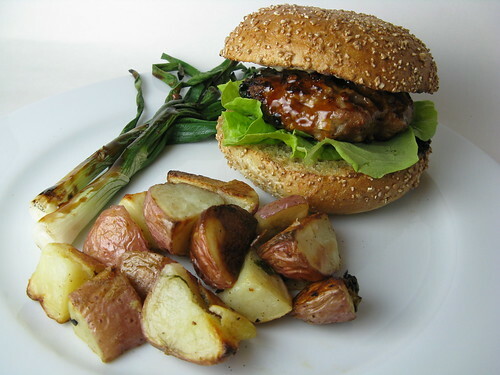 I don't usually like turkey burgers but this recipe makes me want to give them another try. Oh this is definitely way up my alley!! My kind of flavors. That glaze looks especially lovely. that glaze sounds so good, but what I love most is that nice bit of glaze-char on the burger. nice! That burger looks so good! The sweet soy sauce sounds wonderful! This looks oh so good. Great pics. I had purchased a recipe book purely on burgers and you've just reminded me that I have yet to try out any of it's recipes. I better get cracking at it. These burgers look amazing. Oh my they are right up my alley.